Home to four boys, parents and Fido, the family dog Mother Mary Todd, made this parlor "off limits" to the boys' playing and especially Fido's presence. Father Abraham was more lenient. 1837 - Politics: helped to get the Illinois state capital moved from Vandalia to Springfield. April 15; Personal: leaves New Salem and settles in Springfield; Professional: Becomes a law partner of John T. Stuart. In Summer, proposes marriage to Mary Owens, is turned down and the courtship ends. 1838 - Professional: Helps to successfully defend Henry Truett in a famous murder case; Political: August 6, re-elected to the Illinois Gen. Assembly, becoming Whig floor leader. 1839 - Professional: Travels through nine counties in central and eastern Illinois as a lawyer on the 8th Judicial Circuit. December 3, admitted to practice in United States Circuit Court; Personal: Meets Mary Todd, 21, at a dance. Early and Mid 1840's 1840 - Professional: In June, Lincoln argues his first case before the Illinois Supreme Court; Political: August 3, re-elected to the Illinois Gen. Assembly; Personal: In Fall, becomes engaged to Mary Todd. 1841 - Personal: January 1, breaks off engagement with Mary Todd. Has episode of depression; Professional: March 1, forms new law partnership with Stephen T. Logan. In August; Personal: makes a trip by steamboat to Kentucky and sees twelve slaves chained together. 1842 - Political: Does not seek re-election to the legislature; Personal: In Summer, resumes courtship with Mary Todd; Political: In September, accepts a challenge to a duel by Democratic state auditor James Shields over published letters making fun of Shields; Personal: September 22, duel with swords is averted by an explanation of letters; Personal: November 4, marries Mary Todd in Springfield. 1843 - Political: Lincoln is unsuccessful in try for the Whig nomination for U.S. Congress; Personal: August 1, first child, Robert Todd Lincoln, is born. 1844 - Personal: May, the Lincoln family moves into a house in Springfield, bought for $1500; Political: Campaigns for Henry Clay in the presidential election. In December, dissolves law partnership with Logan, then sets up his own practice. 1846 - Personal: March 10, a son, Edward Baker Lincoln is born. May 1, nominated to be the Whig candidate for U.S. Congress. August 3, elected to the U.S. House of Representatives. Later 1840's 1847 - Personal: Moves into a boarding house in Washington, D.C. with his wife and sons; Political: December 6, takes his seat when Thirtieth Congress convenes. December 22, presents resolutions questioning President Polk about U.S. hostilities with Mexico. 1848 - Political: January 22, gives a speech on floor of the House against President Polk's war policy regarding Mexico. In June, attends the national Whig convention supporting General Zachary Taylor as the nominee for president. Campaigns for Taylor in Maryland and in Boston, Mass., then in Illinois. 1849 - Political: March 7 and 8, makes an appeal before the U.S. Supreme Court regarding the Illinois statute of limitations, but is unsuccessful; Professional: March 31, returns to Springfield and leaves politics to practice law; Personal: On May 22, Abraham Lincoln is granted U.S. Patent No. 6,469 (the only president ever granted a patent). 1850 - Personal: February 1, his son Edward dies after a two month illness; Professional: Lincoln resumes his travels in the 8th Judicial Circuit covering over 400 miles in 14 counties in Illinois. 'Honest Abe' gains a reputation as an outstanding lawyer; Personal: December 21, his third son, William Wallace Lincoln (Willie) is born. 1851 - Personal: January 17, Lincoln's father dies. 1853 - Personal: April 4, his fourth son, Thomas (Tad) is born. 1854 - Political: Re-enters politics opposing the Kansas-Nebraska Act. Elected to Illinois legislature but declines the seat in order to try to become U.S. Senator. 1855 - Political: Does not get chosen by the Illinois legislature to be U.S. Senator. 1856 - Political: May 29, helps organize the new Republican party of Illinois. At the first Republican convention Lincoln gets 110 votes for the vice-presidential nomination, bringing him national attention. Campaigns in Illinois for Republican presidential candidate, John C. Frémont. 1857 - Political: June 26, in Springfield, Lincoln speaks against the Dred Scott decision. 1858 - Professional: In May, wins acquittal in a murder trial by using an almanac regarding the height of the moon to discredit a witness; Political: June 16, nominated to be the Republican senator from Illinois, opposing Democrat Stephen A. Douglas. Gives "House Divided" speech at the state convention in Springfield. Also engages Douglas in a series of seven debates with big audiences. 1859 -Political: Illinois legislature chooses Douglas for the U.S. Senate over Lincoln by a vote of 54 to 46; Professional: In the Fall, Lincoln makes his last trip through the 8th Judicial Circuit. December 20, writes a short autobiography. 1860 - Political: March 6, delivers an impassioned political speech on slavery in New Haven, Connecticut. Also in March, the 'Lincoln-Douglas Debates' published. May 18, 1860 - Political: Nominated to be the Republican candidate for President of the United States. 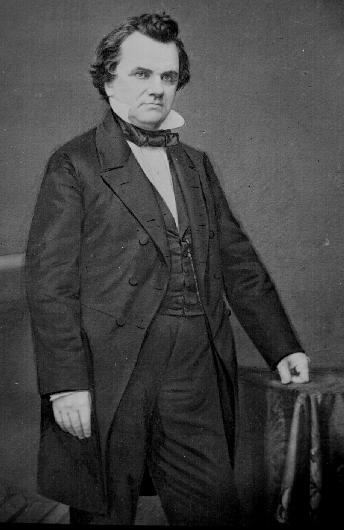 Opposes Northern Democrat Stephen A. Douglas and Southern Democrat John C. Breckinridge; Personal: In June, writes a longer autobiography. November 6, 1860 - Political: Abraham Licoln is elected as 16th U.S. president and the first Republican. Receives 180 of 303 possible electoral votes and 40 percent of the popular vote. Feb 11, 1861 - Personal & Professional: Lincoln gives a brief farewell to friends and supporters at Springfield and leaves by train for Washington. Receives a warning during the trip about a possible assassination attempt.